This charming little market town set in the wide sunny valley close to Kitzbühel is full of Austrian traditions with a Baroque twin spire church and pretty town square filled with quaint cafés that play host to regular festivals and celebrations throughout the summer. There are plenty of shops and restaurants - guests enjoy the ‘Huber Bräu’ local Brewery with its very own tower, for traditional cuisine and views. The town is surrounded by miles of gentle walking and cycling paths, including riverside and valley walks to Kitzbühel, as well as up to higher peaks accessible by gondola. Bus and train links are excellent and its central location between Innsbruck and Salzburg make it a great base for excursions. There is a full programme of events run each week by your Inghams Rep.
Here’s an unusual one! 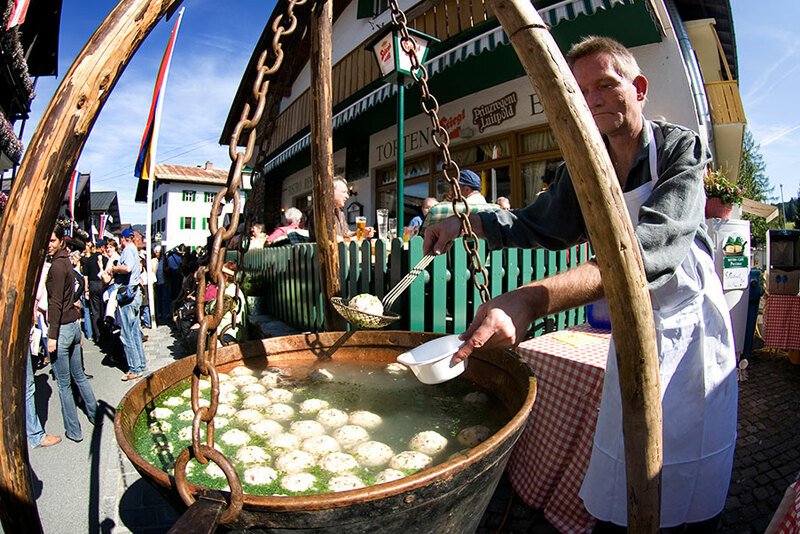 The 38th Dumpling Festival in St. Johann, Austria on the 21st September 2019 with the longest dumpling table in the world, 300 meters long producing around 25,000 delicious dumplings! St. Johann’s main street, Speckbacherstrasse, becomes one enormous open-air restaurant. Socializing with the locals, traditional brass band music and lots of good food and drink are the order of the day! Set in a pleasant location close to the gondola and just 5 minutes’ walk from the centre. With high standards of food and service, this hotel lies in a quiet location 10 minutes from the village centre. The whole hotel is non-smoking. Transfer Approx. 2hr by coach. Visit Mozart’s birthplace, the Hohensalzburg Fortress, the medieval Old Town and the famous Getreidegasse shopping street. An optional walking tour brings the history of this beautiful city to life. We recommend the walkers’ lift pass for access to a variety of walks for all levels. The lift runs from approx. 23 May. First stage of the ‘Eagles Way’ heading west to the Rummierhof Inn | Moderate | This stage gived fantastic views over St. Johann and the Kitzbühlerhorn. St. Johann Tourist Office runs FREE programme of guided walks that changes weekly, plus hiking booklets and stamps for those completing stages of the ‘Eagles Way’.